Simply Raising 8: Attended a #Redbook Happy hour house party! 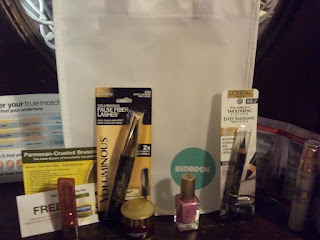 Attended a #Redbook Happy hour house party! L’Oréal, RedBook, Lipton and Hellmanns sponsored this great RedBook Happy Hour House Party I attended tonight. I received full size products of each of these items as well as a coupon for a free jar of Mayonnaise. I am sold on the Colour Rich Balm. I love how it does not go on too dark and it is not Thick and gross feeling like many lip products I have tried. The color was great also. I received Plush Plum and I am loving it. Way to go to all the great sponsors for a great Girls night out. Oh yeah and when I get my first issue of the Free years subscription to Redbook that all of us girls received I will take time to sip my Tea and read.. Thanks To Kelli Hoffman for hosting this event. I will be sure to attend the next party you have. All of us Girls had a blast and learned a few things about our skin tone as well. I also got a recipe card that my husband spied in the bag and wants me to try from Hellmanns which can be found here for PARMESAN CRUSTED CHICKEN! Thank you for coming and sharing your experience at the party!